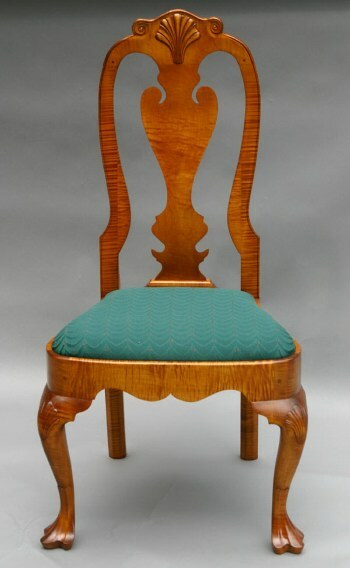 Based on a famous example of a high style Philadelphia Queen Anne chair featured in Albert Sack's book The New Fine Points of Furniture - Early American. Sack labeled this chair as an American Masterpiece. The original chair was constructed between 1740 - 1760 and was made from walnut. 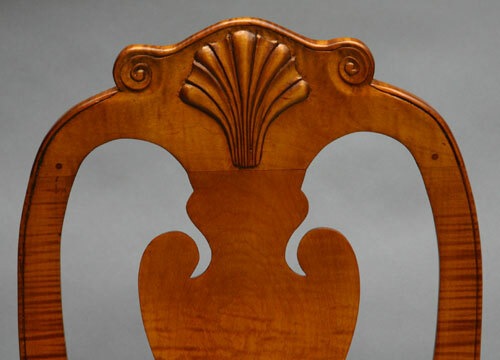 This chair features a balloon or compass shaped seat, a highly detailed splat profile, carved shells on the knees and crest rail, beading along the rear legs which ends in a pair of scrolled volutes, and a pair of trifid front feet. 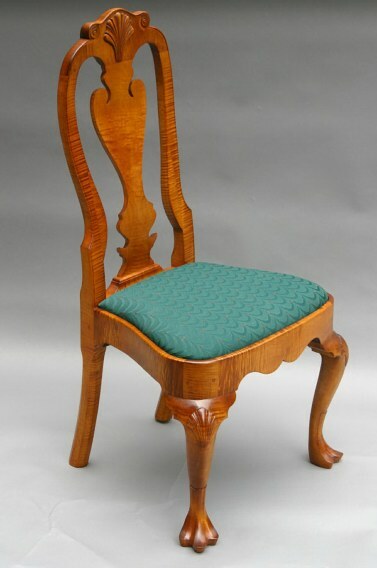 The use of a very traditional chair joint - the wedged through mortise and tenon - where the side seat rail joins the rear legs was typical in Philadelphia during the early 18th century and represented one of the pinnacles of chair construction techniques. This chair is shown in solid tiger maple with an antique maple stain and a hand rubbed shellac finish. Solid tiger maple construction - many other woods available including mahogany, cherry and walnut. Hand shaped legs, back and crest rail. Curved front rail carries leg curve across front of chair. The side rails connect to the rear legs with the traditional Philadelphia trademark joint -a wedged through mortise and tenon. Pinned mortise and tenon joinery used throughout. The chair back is shaped to provide comfortable support for extended sitting. Slip seat design - seat is upholstered in a traditional manner with webbing, padding and muslin - seats will be covered with customer's choice of fabric if provided. Hand rubbed and waxed to a satiny sheen.